D. Koutsouras*, E. Bihar*, J. Fairfield, M. Saadaoui, G. G. Malliaras, Green, Materials for Electronics, Fabrication approaches for conducting polymer devices, submitted to Advanced Materials Technologies. Bihar, E., Roberts, T., Ismailova, E., Saadaoui, M., Isik, M., Sanchez‐Sanchez, A., ... & Malliaras, G. G. (2017). Fully Printed Electrodes on Stretchable Textiles for Long‐Term Electrophysiology. Advanced Materials Technologies, 2(4). Bihar, E., Roberts, T., Saadaoui, M., Hervé, T., De Graaf, J. B., & Malliaras, G. G. (2017). Inkjet‐Printed PEDOT: PSS Electrodes on Paper for Electrocardiography. Advanced healthcare materials, 6(6). ElMahmoudy, M., Inal, S., Charrier, A., Uguz, I., Malliaras, G. G., & Sanaur, S. (2017). Tailoring the Electrochemical and Mechanical Properties of PEDOT: PSS Films for Bioelectronics. Macromolecular Materials and Engineering. E. Bihar, Y. Deng, T. Miyake, M. Saadaoui, G.G. Malliaras, and M. Rolandi, “A disposable paper breathalyzer with an alcohol sensing organic electrochemical transistor”, Sci. Rep. 6, 27582 (2016). M. Papaiordanidou, S. Takamatsu, S. Rezaei‐Mazinani, T. Lonjaret, A. Martin, and E. Ismailova, “Cutaneous Recording and Stimulation of Muscles Using Organic Electronic Textiles”, Adv. Healthcare Mater. 5, 2001 (2016). M. Braendlein, T. Lonjaret, P. Leleux, J.‐M. Badier, and G.G. Malliaras, “Voltage Amplifier Based on Organic Electrochemical Transistor”, Adv. Sci. 4, 1600247 (2016). W. Lee, D. Kim, J. Rivnay, N. Matsuhisa, T. Lonjaret, T. Yokota, H. Yawo, M. Sekino, G.G. 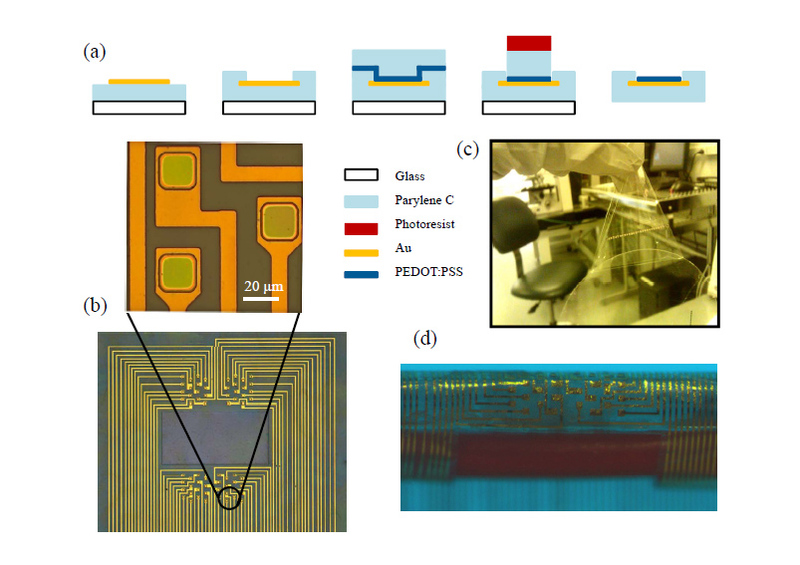 Malliaras, and T. Someya, “Integration of Organic Electrochemical and Field‐Effect Transistors for Ultraflexible, High Temporal Resolution Electrophysiology Arrays”, Adv. Mater. 28, 9722 (2016). S. Takamatsu, T. Lonjaret, E. Ismailova, A. Masuda, T. Itoh, and G. G. Malliaras, “Wearable Keyboard Using Conducting Polymer Electrodes on Textiles”, Adv. Mater. 28, 4485 (2016). P. Gkoupidenis, D.A. Koutsouras, T. Lonjaret, J.A. Fairfield, and G.G. Malliaras, “Orientation selectivity in a multi-gated organic electrochemical transistor”, Sci. Rep. 6, 27007 (2016). I. Uguz, M. Ganji, A. Hama, A. Tanaka, S. Inal, A. Youssef, R.M. Owens, S. Dayeh, and G.G. Malliaras, “Autoclave Sterilization of PEDOT: PSS Electrophysiology Devices”, Adv. Healthcare Mater. 5, 3094 (2016). A. Jonsson, S. Inal, l. Uguz, A.J. Williamson, L. Kergoat, J. Rivnay D. Khodagholy, M. Berggren, C. Bernard, G.G. Malliaras, and D.T. Simon, “Bioelectronic neural pixel: Chemical stimulation and electrical sensing at the same site”, Proc. Natl. Acad. Sci. 113, 9440 (2016). S. Inal, J. Rivnay, A. I. Hofmann, I. Uguz, M. Mumtaz, D. Katsigiannopoulos, C. Brochon, E. Cloutet, G. Hadziioannou, and G. G. Malliaras, “Organic electrochemical transistors based on PEDOT with different anionic polyelectrolyte dopants”, J. Polym. Sci. Part B: Polym. Phys. 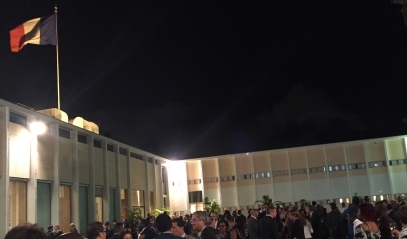 54, 147 (2016). 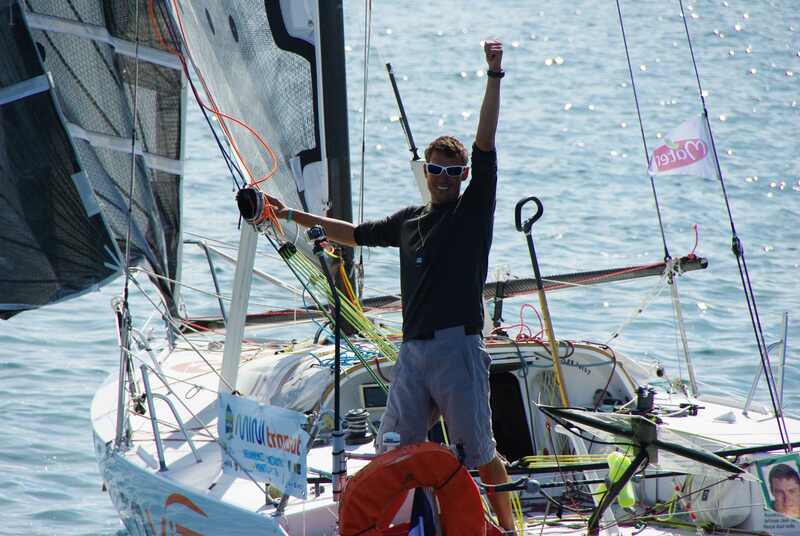 Great first stage for our Skipper: BRAVO ludo ! And thanks Ludo for having tested our connected Tee-shirt !! 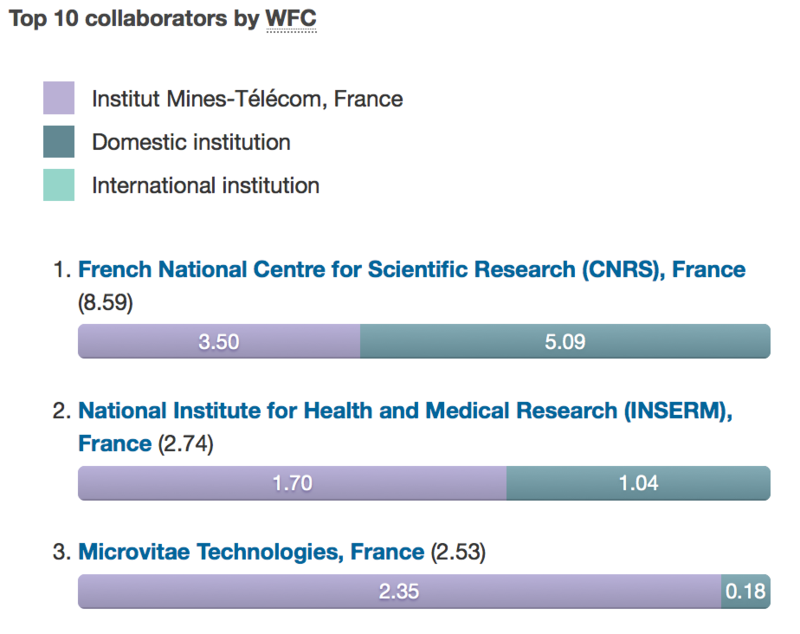 Microvitae has established RESEARCH partnership since 2010 with prestigious French INSTITUT MINES-TELECOM. This collaboration based on 2 Ph.D. thesis passed in 2013 and 3 on going Ph.D's programs, has provided majors publications in high IMPACT FACTOR journals : Natures Comms in 2013, Science Advances, Adv. Healthcar Mater, J. Mater. Chem., Advanced Mater. 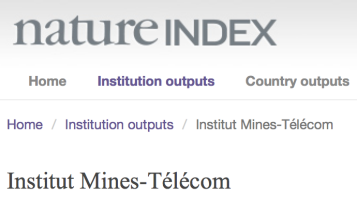 MICROVITAE appears as 1rst Industrial partner for RESEARCH with INSTITUT MINES-TELECOM. 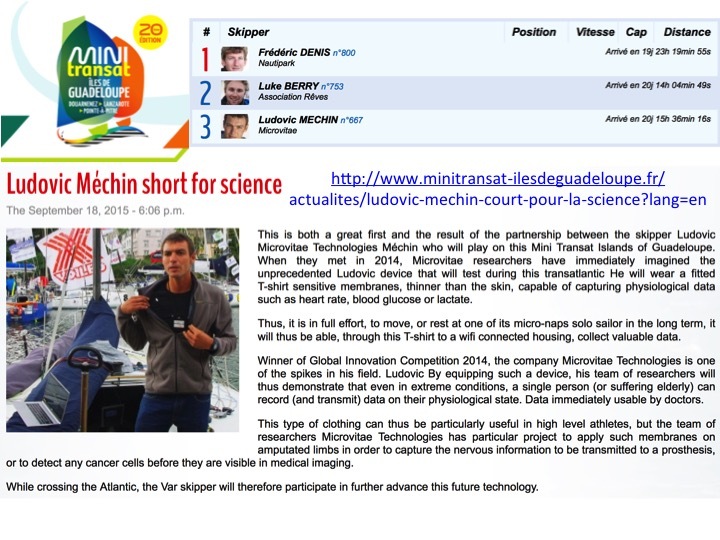 Along the 2015 mini TRANSAT race, Microvitae’s Skipper, Ludovic MECHIN, wears a Low Energy Bluetooth connected Tee-Shirt that continuously and automatically sends recorded physiological parameters to a remote device inserted in the mini 667’s electronics board (in agreement with « class mini regulations »). This monitoring is acheived thanks to MICROVITAE extra-thin organic conductive films technology. Such experimentation is performed in very « harsh » conditions such as complete isolation, strong humidity and permanent movement. Not only Sport applications are seeked, but also medical monitoring of isolated persons like elderly people at home. 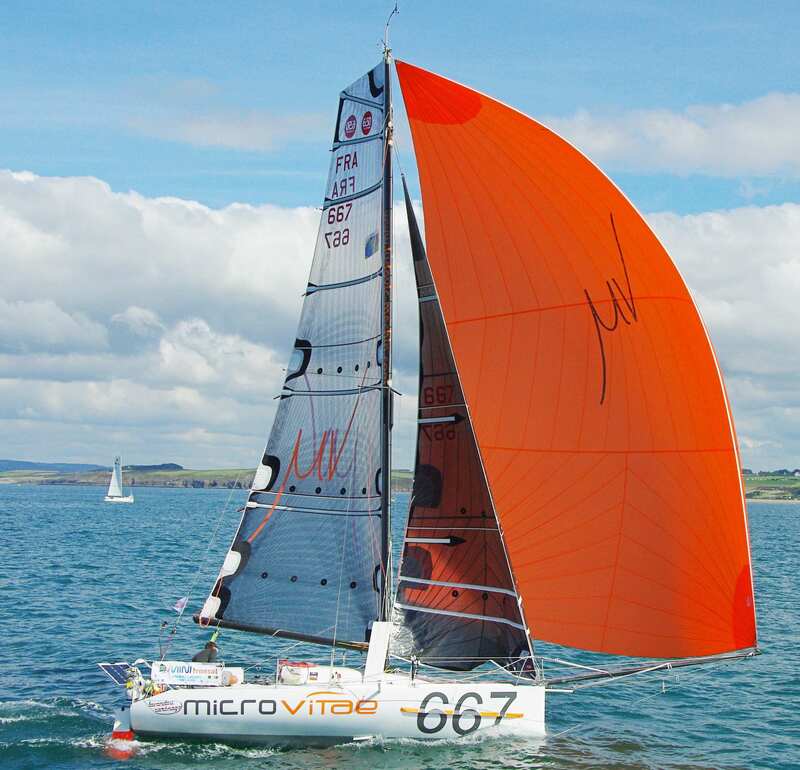 MICROVITAE's MINI 667 was on start line of 2015 mini TRANSAT last September 19th. 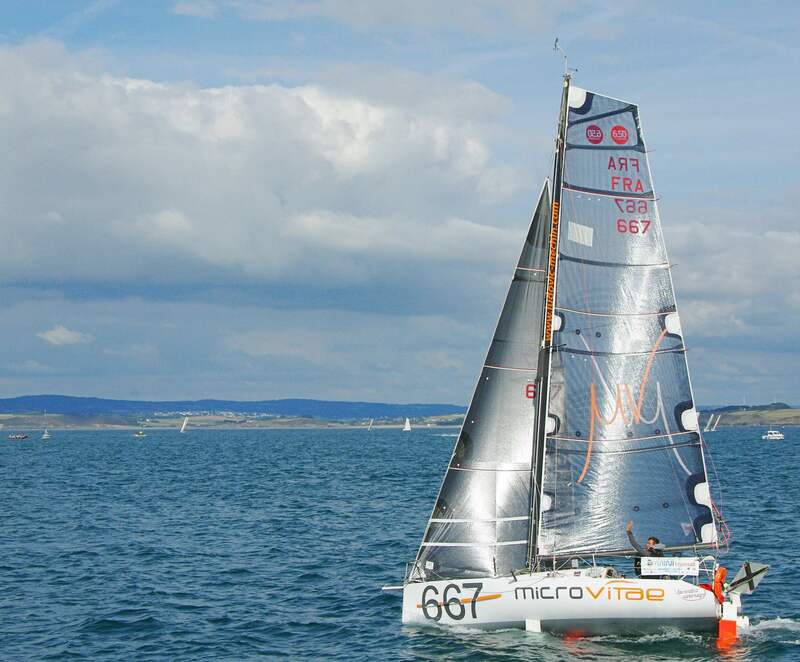 The route across the Atlantique Ocean starts from DOUARNENEZ (Britany-FRANCE) to LANZAROTE (CANARY Islands - SPAIN) and then from LANZAROTE to POINTE-à-PITRE (Guadaloupe Islands - FRANCE). This 4020 miles solo race permits no without assistance nor long distance communication. 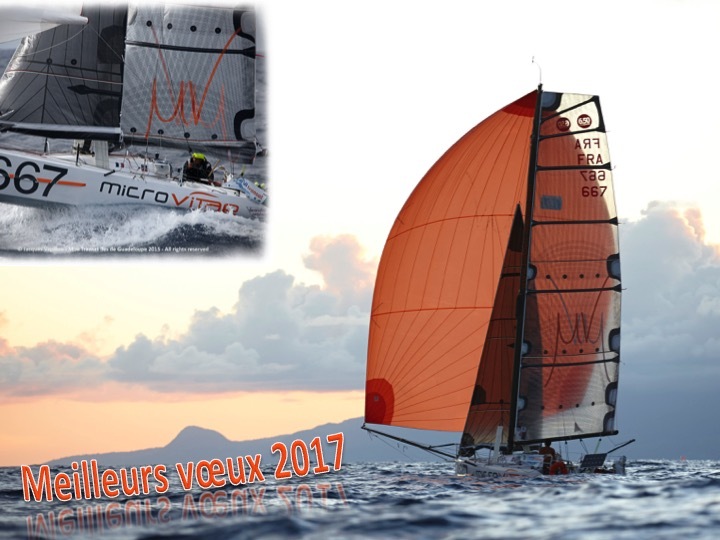 Our skipper, Ludovic MECHIN, wears a prototype PHYSIOLOGICAL MONOTORING connected tee-shirt based on organic transistors (NATURE march 2013, NATURE july 2013, Adv. Healthcare Mater. 2014, J. Mater.Chem. C 2015) of MICROVITAE Technology (Winner of the 2014 Worldwide Innovation Challenge). Physiologcal signals are transmitted via Low Energy Bleutooth wireless system to a small remote data logger inserted in the 667’s electronics. 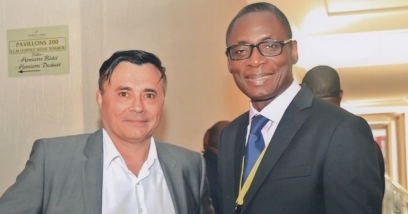 Thierry HERVE, its CEO, was received last March 20th by French Prime Minister as one of the 58 Prize-Winners of this contest to which 625 companies appplied. 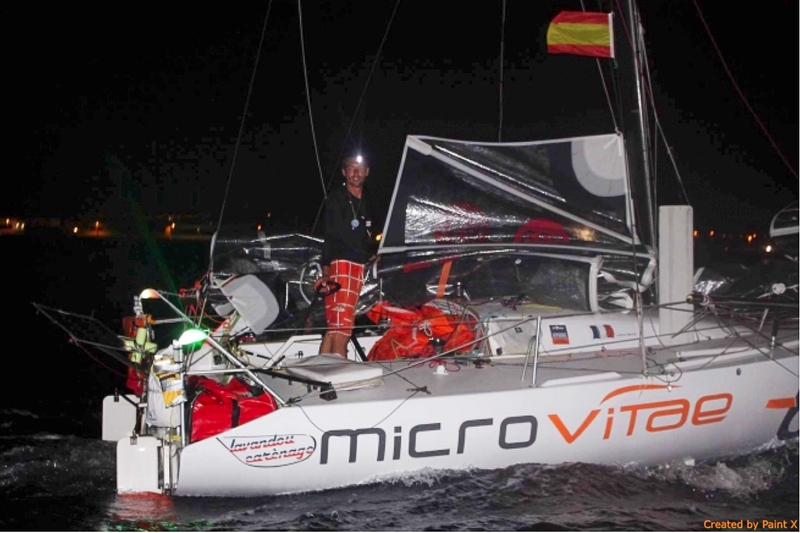 MICROVITAE's CAPITAL is 2.000.000€ since last 2014, March 3rd. NATURE COMMUNICATIONS | 4:2133 | DOI: 10.1038/ncomms3133 | www.nature.com/naturecommunications. The development of transistors with high gain is essential for applications ranging from switching elements and drivers to transducers for chemical and biological sensing. Organic transistors have become well-established based on their distinct advantages, including ease of fabrication, synthetic freedom for chemical functionalization, and the ability to take on unique form factors. These devices, however, are largely viewed as belonging to the low-end of the performance spectrum. Here we present organic electrochemical transistors with a transconductance in the mS range, outperforming transistors from both traditional and emerging semiconductors. The transconductance of these devices remains fairly constant from DC up to a frequency of the order of 1 kHz, a value determined by the process of ion transport between the electrolyte and the channel. These devices, which continue to work even after being crumpled, are predicted to be highly relevant as transducers in biosensing applications. 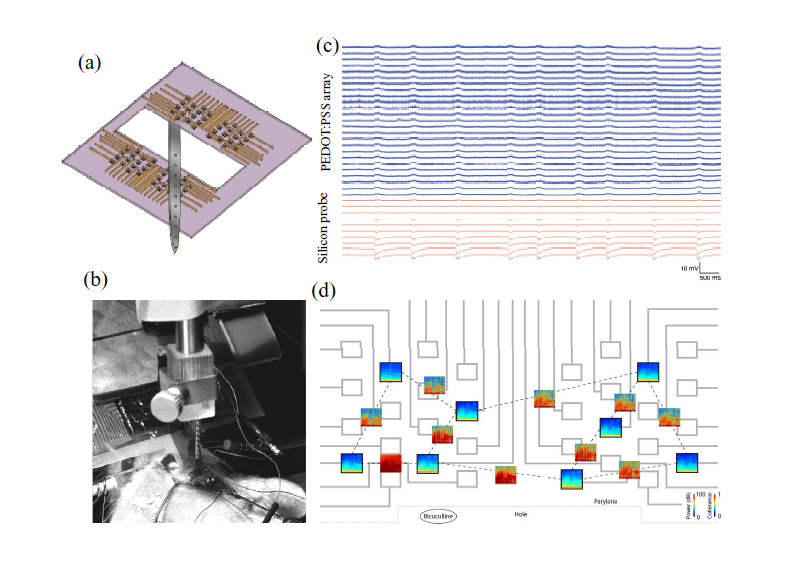 1) Design and validation of electrodes for human multiscale electrophysiological recordings, Leleux, P. , Bénar, C., Badier, J.-M., Hervé, T., Malliaras, G., Chauvel, P.